Due to the incredible popularity of Agile Coaching, the demand to hire Agile coaches has increased in the last years. Many companies are looking for this role, and several people are offering services in Agile Coaching. It is possible to see different styles and flavours in doing Agile Coaching, which is good because diversity is important in our industry; however, the most dangerous part is the massive number of strange job announcements, asking for Agile Coaches, that I have seen over there. For this reason, I think we need to reflect on whether we know what Agile Coaching is and what the expected outcomes for this role are. I have been working with Agile since 2002 (I started with Extreme Programming to be more precise), and I have been providing Agile Coaching since 2008. Since then, I have experienced different ideas, formats, and techniques to support my job as an Agile Coach. Because of this, I recognise it’s hard to put this role into a box. To be honest, it’s challenging creating a universal definition for this sort of role. However, even with this ambiguity, there are essential elements to define us as Agile coaches. Trying to find this essence may be similar to examining the DNA of some type of specimen. We can have different shapes of organisms, but, at the end of the day, every cell has the same genetic information. I have synthesised five key elements to drive my performance as Agile Coach. I put these components into a model called Agile Coaching DNA. This model represents my essence as Agile Coach. This DNA works as a compass to guide my decisions about which practices and approaches I can use to help my clients to achieve better results. I’m sharing this text because I believe this model can help others people to take some inspirations to become better Agile Coaches. Agile Coaching is an approach to foster an organisation shift to improve the work, the behaviours, and the outcomes in the context of the development of solutions/products. It is not only about adopt framework X or Y. Agile Coaching is about how to enable people to respond more quickly, with less risk, and more qualitatively for business opportunities. To provide this enablement, Agile Coaches can work on five elements (see the image above): Catalyse Improvement, Promote Awareness, Boost Ownership, Develop Competencies, and Facilitate Barrier Removal. Those elements work as big goals for Agile Coaches. Let’s talk a little bit about those elements. Agile Coaching is about change (period!). It is about how we can improve the organisational behaviours, at different levels, to produce better results. Agile Coaches must act as catalysers for the continuous improvement culture. Providing support and facilitation to the change journey is the primary element during the Agile Coaching process. As Agile Coaches, we need to continuously help organisations, teams, and individuals in the journey from the current state to the future state. That is the real gist of coaching. As Agile Coaches, we need to master models regarding change management/facilitation. Those models can help us to support people to create a smooth journey toward the change. To catalyse the improvements, it’s important to help people to be aware of the problems, gaps, needs, options of solutions, etc. Most of the times, Agile Coaches give support to people to explore their mindsets, behaviours, and consequences to promote changes and improvements. Another good example is about Agile itself. We can use data-driven culture and all sort of metrics (Flow, Lead-time, Cycle-time, Throughput, Velocity, Cost of delay, Business value, etc.) as enablers for awareness in organisations. In this case, as Agile Coaches, we can use the Kanban Method to start helping teams and organisations to visualise the workflow. Based on this shared awareness, we can help people to identify the opportunities for improvements. Awareness can lead people toward engagement. If we are aware of our problems and their implications, we are more likely to feel responsible for the solution. Ownership means that the person has sufficient commitment on the path toward some goal. In others words, the person is committed to knowing why and how to build the road to reach his or her purpose. This situation builds self-esteem and self-motivation. For this reason, when an Agile Coach provides answers or dictates exactly how to solve some problem, it compromises the Coachee’s ability in learning how to learn. Also, give answers maybe will create a dangerous dependency to the Agile Coach. In this case, the Coachee (the individual, team, or organisation) will always need help from the Agile Coach to create and maintain the improvements. Boost ownership is the reason why most of the Agile Coaches are temporary agents in the organisations. As a take away to boost ownership, Agile Coaches should avoid dictating the solutions and must practice a non-judgemental approach to help people to build their path toward some goal. During an Agile transformation/change initiative, there are lots of obstacles to adopting new behaviours and practices. Most of the time, Agile Coaches must act as change facilitators. As I explained in my blog post about Tips for Change Facilitation , A Change Facilitator is someone who helps the organisation to identify the opportunities to improve and foster collaborative strategies to maximise the success of the change efforts. We always have driving forces (positive forces) and restraining forces (resistance) to achieve any goal during a change initiative. For this reason, we need to reduce the resistance and take advantage of the positive forces. However, Agile Coaches are not secretaries for the organisations. Facilitating barrier removal is about how to help people to develop the skills and resources to overcome the barriers by themselves. It’s important to remember: teach to fish, not give a fish. In this case, teach people to remove obstacles by themselves instead of merely removing barriers for them. As you saw in the previous elements, helping people learn new skills (hard and soft) is one of the key ingredients of Agile Coaching. To develop people’s skills, we can create a combination of two approaches: Coaching and Mentoring. However, there’s a huge difference between both. When we are acting as a mentor, we provide the correct answers to solve some problem. When we work as a coach, we are always trying to promote awareness and ownership in the people so that they can build their solution. It is important to make this difference pretty clear for the audience. Also, it is vital that the Agile Coach recognises which kind of situation to which coaching and mentoring could be applied. As Agile Coaches, we also need to help the organisation in creating strategies to promote a learning culture. We can use different practices to reach this goal. One of the ways is called Learning 3.0. It is about how we can create an organisational environment to foster collaborative and emergent learning inside the teams. I’ve synthesised those elements into this model to serve as a compass to drive the behaviours and outcomes for my work as an Agile Coach. I always need to evolve this DNA. I need to add more practices and elements according to the environment of the company or the team. You’ll need to make the same thing in your context. You can create an infinite number of genetic combinations with this DNA. I’ll present three examples of evolutions for this model below just to give you a brief inspiration. The first image shows a case regarding how to extend this DNA providing Agile Coaching at the team level. 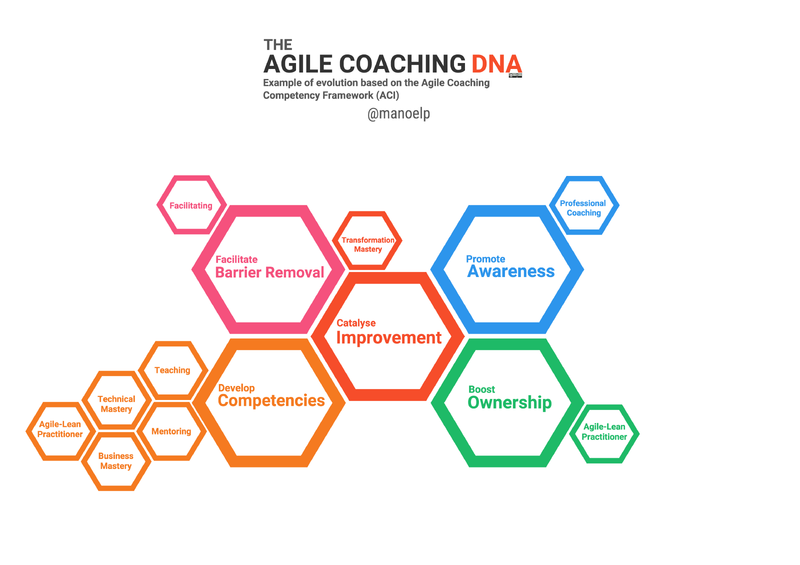 The second image is about how we can combine this DNA with the Agile Coaching Competency Framework. This framework is a useful and popular model created by the Agile Coaching Institute. 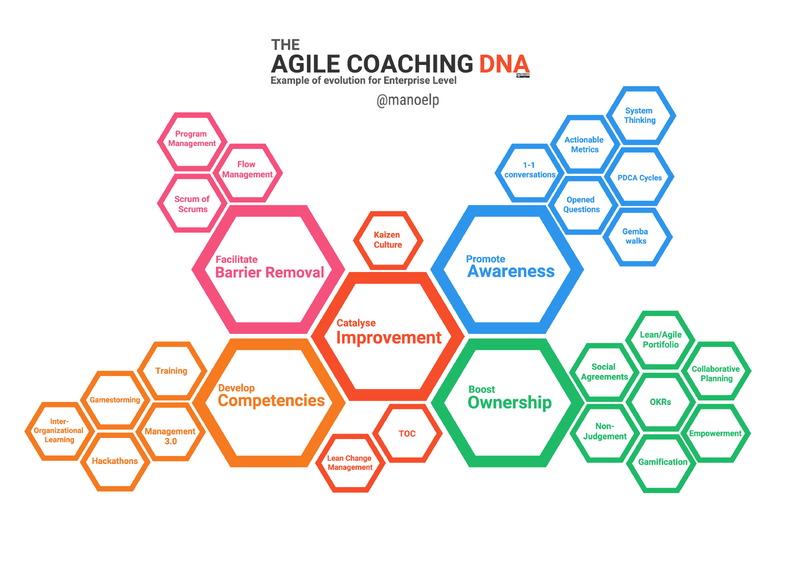 The Agile Coaching DNA can help you to tie together the competencies described in this framework. The third figure explains how we can apply the Agile Coaching DNA to drive practices and ideas for coaching at the enterprise level. It is important to notice the essence is still the same; however, coaching at the enterprise level requires different skill sets. I have been using this DNA in a variety of ways because each person, team, and organisation has different problems and different contexts and requires different approaches. Even applying different approaches, I’m trying to keep the congruency with these five key elements. 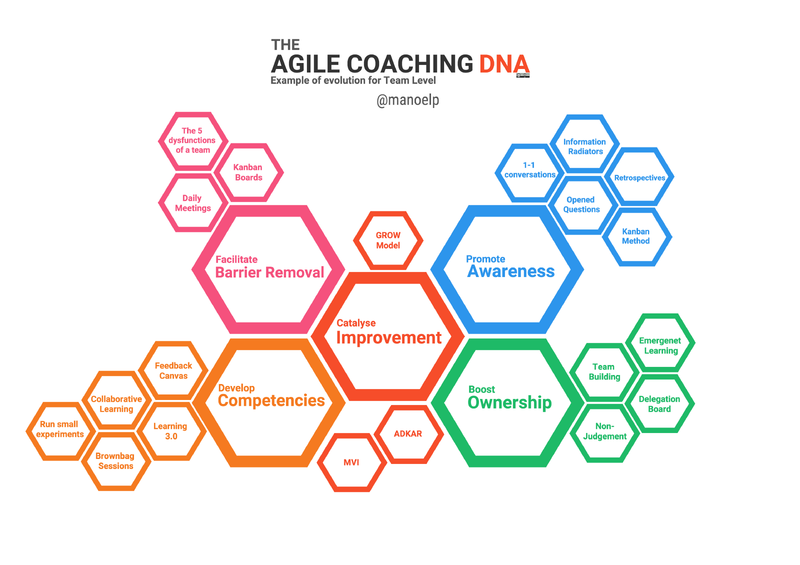 The Agile Coaching DNA is a compass for my work as an Agile Coach. I did not come across those elements overnight. I’ve spent years doing coaching, researching, and working with other colleagues to identify the characteristics of good Agile coaches. 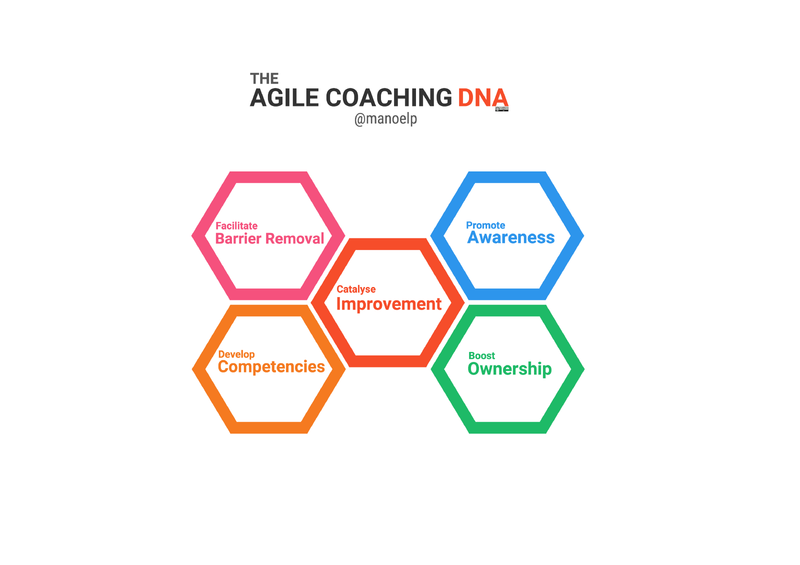 The Agile Coaching DNA is the synthesis of this long journey. My intention with this text is to inspire you to think about your performance as an Agile Coach and what you can do to improve your work. Feel free to use this DNA as a compass/driver for learning, and to contact me for more information about this model. I’m more than happy to help. I’m a Catalyser of changes, author of the book ‘The Agile Coaching DNA’, Speaker, Cyclist enthusiast, and Agile Coach at Elabor8 (Australia). It's a space to share ideas and experiences about organisational change management/facilitation.